It was a chilly Monday afternoon with a bright sun doing little to dispel the cold and wary atmosphere. As we walked towards the Union Gospel Mission Men’s Shelter, there were several homeless men in puffy, black jackets loitering around and I sensed my party apprehensively draw into a tight formation as we approached the entrance. There were five of us: my dad, two sisters, grandma and myself. We quickly scurried into the building, not knowing what to expect. The shelter reminded me of a middle school cafeteria. Everything seemed rather clean, if a bit musty, and the place was well lit and inviting. Immediately at the entrance was a booth where two or three people were chatting on the phone, eyes on computer screens, but someone noticed us and asked if he could help. 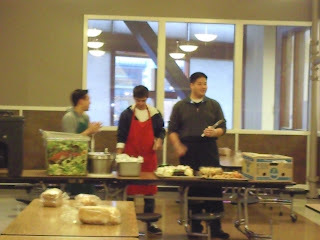 My dad said that we were volunteers from Indonesian Presbyterian Church (IPC), there to help serve dinner for the night. Then he signed off on a form and we were all sent back to the kitchen for orientation. The people in the kitchen were friendly. One was a tall black man with a smile on his face and the other was a short, tough guy who might have been Hispanic. We later found out that he was the football coach of one of our fellow volunteers, which helped us all relax. We waited awhile since the full force of 15 people had not yet arrived and got started by storing our jackets and bags in a locked closet. We were soon busy putting on aprons, washing our hands, putting on gloves and learning about the different roles in the cafeteria. I would be assigned to serve salad from the middle of the cafeteria with several other men who would serve dressing, cheese and desserts. The ladies got to stay behind the kitchen counter and serve meals on trays. Union Gospel Mission has about one hundred residents who actually live in the shelter and go through a recovery program called New Creations. These men get one-on-one counseling through the Genesis Addiction Recovery process, participate in Bible studies and take daily responsibilities within the Mission. We started serving these residents at 5:00pm—they get first dibs. At 5:30pm, the doors opened for everyone and anyone to come in from the streets and have a free meal. My friends and I were ready around 4:45pm, so we joked about school and girls while waiting for the clock to run down to dinner time. Eventually several residents filed into the cafeteria. They were all clean and most were friendly as they collected their food. One of the residents who I’ll call Jim chatted with my dad while he ate. He was a tall white man with tattoos on both arms and a short, orange beard. I had no idea what they were talking about, but it seemed engaging. Soon the doors opened for everyone else; the panoply of Seattle’s homeless. Some smelled of urine while others looked like they were fresh out of the shower. Some wore dilapidated shirts and pants with grimy jackets while others may have shopped at Nordstrom’s. I couldn’t help but think that some of these folks weren’t homeless at all—just freeloaders looking for a free meal—but who am I to judge? Even though it was a Men’s Shelter, there were women in line for food as well. One older woman was very well dressed and even brought her own plate and silverware. This sharply contrasted with others who looked really dirty like kids who had just played out in the rain. It was a sad and joyful scene. Sad that people had to endure such difficult lives, but joyful that we got to be of service and experience what it’s like to love like Jesus does. There is a sense in which His love is indiscriminate, people who are so poor you can’t help but help them, people who don’t say thank you when you serve them, people who freeload, and people who shine with gratitude—Jesus Christ is kind to all whether they are grateful or not. As I served salad out of a giant tub, Jim ambled over and sat down next to me, surveying the room. I asked the next man in line “Would you like some salad, sir?” He nodded his head with a big smile and said, “Yes, yes, thank you! God bless you!” I probably wouldn’t have thought much of it, except that Jim stood up and whispered to me, “You hear that man thanking you? That’s the Holy Spirit thanking you, right there.” And a few moments later he said with soft-spoken passion, “Jesus died for every person in this room.” While I was somewhat wary of the theological imprecision of his statements, I was moved too. It was as if God were so pleased with us and delighted to see us serving the poor. His pleasure is contagious. When dinner was over we helped clean up a bit while other residents came down and mopped the floor. I was relieved and rejuvenated. A lot of my worries and suspicions about the homeless gave way to compassion. After feeding everyone freely, UGM has a chapel service. No one is required to go, but everyone who attends is allowed to sleep on the foam mattresses they setup in the cafeteria. They do this tirelessly day after day: serving the poor, feeding the hungry, preaching the gospel and watching God do the impossible. If you find your soul in need of refreshment, I highly recommend going. The grace you experience serving at UGM is a great way to remember (or encounter for the first time) the grace everyone—homeless or not—can experience at the Cross. Contact www.ugm.org for more information. Article written for Indonesian Presbyterian Church.